The Well Aging Fiddler - 20 observations after 9 months of playing my violin. February 24, 2018, 9:08 AM · I’ve been playing violin for nine months. I’ve planned a recital in a pub for my one-year anniversary where I’m going to play just about everything I’ve learned in a year. Here is what I’ve learned. 1. Patience - When I started to play last May I assumed I could do a tune within a couple of hours. Because I already play guitar and mandolin I thought it would be a no-brainer. Man, was I wrong on that one. There is no way to rush any of this. As you know there are so many elements into just moving the bow over the strings that it is useless to cave into frustration and gloom. 2. As far as I can tell, pitch is everything - I was in a recital last October and I played a somewhat complex piece. While I got through it, and I hit all the notes at the right times, my pitch was iffy to say the least. Then a young girl got up and played a simple Irish tune. It was lovely. It wasn’t complex or difficult, but it was in tune. So forget going fancy or trying to impress people with memorization skills. If it doesn’t sound good, it isn’t good. Get it down. 3. Don’t play while your wife is trying to take a nap - Seriously. It's not a good idea. Actually, it's a very BAD idea. I really don’t think I need to explain this further. Oops. 4. Practice every day - I do this. I practice between 60 and 90 minutes a day. I try to do this when my wife isn’t home. It has become a habit. I wake up in the morning and plan when I’ll practice. However, there is more to practice than doing it each day. This is just the basics. 5. Don’t play at nighttime if you live in an apartment or townhouse - I live in a townhouse. I also play in the room that is the farthest from my neighbor’s walls. Nobody has ever complained about my playing, and I want it to stay that way. Therefore I don’t play before 8:30 a.m. and rarely after 5 p.m. Why push it? 6. Practice slowly -This is essential. Don’t rush. Get the rhythms down. If you can’t play it slowly, you can’t play it at all. I’ve tried faking my way through it by going fast. Nope. You know what that sounds like? It sounds like I’m faking my way through it. It took me a long time to learn this simple rule. Don’t rush. Don’t rush. Don’t rush. 7. Handle difficult passages first - I had a bad habit when I was learning guitar and mandolin. I’d just keep playing the songs over and over without stopping to fix the tricky parts. I simply assumed they’d correct themselves. Of course, the opposite happened. The mistakes became the way I learned those passages. So pull them out, work on them until they are right, and put them back in once they are correct. 8. Play with others whenever possible - I need to do more of this because it’s fun. A year ago I attended Bluegrass and old time music jams with my guitar and mandolin, I noticed a lack of violins. Guitars, mandolins, and banjos were abundant, but violins were often completely missing. When I leaned that a violin and a mandolin are tuned the same I figured I’d add violin to my list of instruments. At this point, I don’t know enough fiddle tunes to play in a jam, but I’m going to get there. Still, I have played with my fellow violin students at student soirees hosted by my teacher, Mirabai Peart, and it’s a lot of fun. 9. Get the technical stuff down so it becomes invisible - I’m still working on all of this. I assume a year from now I’ll still be working on all of this. However, some of this has sunk in as far as my bowing goes. Give it all of your attention, and do that over and over. Then let it become so habitual it feels like it has always been that way. 10. Take breaks when practicing- While I practice 60 to 90 minutes a day, I don’t do it all at once. I break it down into 30-minute sections. I’ll practice, and then I’ll do some laundry or empty the dishwasher, or take a short walk, or listen to a podcast, or make the bed. This keeps it fun. 11. Celebrate everyone who plays no matter what their skill - Humility is a necessity. This instrument will keep you humble. People are a whole lot better than you. Other’s are not as good. Celebrate it all. 12. Don’t lock in your practice routine - I did this for a while and it got impossible to maintain a good schedule. Yes, do scales, arpeggios, finger exercises, new songs, hard passages, familiar songs and so forth, but don’t lock it all into a singular pattern. I did scales and arpeggios for the first half hour, new stuff the second, and older material the third. The problem was it got rather dull. Mix it up. Do some scales, then handle rough things, or start with a favorite song and work gently into the session. Mix it up. 13. Mistakes are growth but only if you learn from them - Don’t turn your mistakes into bad habits. Learn from them, correct them, make new mistakes, correct them, and repeat all of this until it works. 15. Know when to stop practicing - It isn’t a marathon race. When your focus starts to go, when you feel you aren’t really there, when it gets to be too much stop for the session or even for the day. You can’t learn if your not focused. 16. Watch the documentary, “Strad Style”. - It’s fun. I just love that film. It’s available on Amazon. I even wrote to Daniel Houck and asked about buying a violin. He wrote back! Cool, eh? I didn’t buy one. Not ready for that leap yet. Great documentary. 17. Plan on a recital or some sort of performance - Have you arrived to the point where I am? You’ve got around 20 short tunes and you’ve been playing them over and over again for the walls in your room? Well, I don’t know about you, but it was getting a little dull, and my enthusiasm was waning. Then I decided to have my own recital. Now, I know teachers like to say when something is ready to be preformed, but I’m lucky enough to have a teacher who likes to take risks and push the envelope. Look – I’m not a kid. I’m going on 69 years old. In a few ways, this is a no-time-like-the-present situation. I’m doing it. I’m playing all 20 + tunes in a pub in May. I’m calling it the One Shot Through and Take No Prisoners First Year Violin Recital. Why not? You are invited to attend. 18. Record your lessons and take notes when you play them back - This really helps. This week I was messing up on pitch (a rather frequent event) and my teacher, Mirabai Peart, said I’d had the pitch correct about three weeks ago. There was some sort of phrase she said that locked it in for me. I went back into my lesson notes and found the magic mantra. So record your lessons and take notes. It really helps. 19. When in airports, and people ask if you are a concert violinist, don’t say “no”. - I fly back and forth across the country to visit my children and grandchildren. I carry my violin with me. I also wear a nice shirt, good shoes, and a blazer. Hence I look nice and subsequently, I look like I know what I’m doing. Of course it’s something of an illusion. I wear good shoes because they don’t need laces and I can slip them off at the security check without difficulty. I wear a blazer because it has lots of pockets so I can slip my cell phone, cash, and other metal objects in the pockets. I can remove the blazer at the security check without dumping all that stuff in one of those baskets. Hence, I look like I mean business, when I’m actually just hoping to find a nifty refrigerator magnet in the gift shop. Some people walk up to me and ask if I’m a concert violinist. When used to confess I was just a beginner their faces would fall and they’d walk away. So, now - in the interest of keeping hope alive in this world - I just smile and say something like, “I’m going to Washington D.C. to play”, or “Doing some music in Minneapolis.” They suddenly smile and seem to reach their own conclusions. I should probably invite them to my recital in May! 20. Maintain a good sense of humor about all of this - You’ve got to laugh. This thing is not easy to play, it takes years, so settle in and enjoy the ride. February 24, 2018 at 06:42 PM · Love your personal take on this. I'm not a musician, but I still enjoyed the suggestions. Many of them apply to almost anything one is trying to learn! February 25, 2018 at 01:13 AM · I know this guy. He is a wise guy, His guise is wise. Actually, Michael is a what you see is what you git. And yes he is wise, and a guy to boot. Michael, by golly will play. He knows how, and probably fiddles sweet lullabyes. Because his music is his wiseguyisness. February 25, 2018 at 02:23 AM · #10 and #12!! Very important!! I too have to mix it up or I’ll get bored and not want to get my violin out and yes, I also do about 39 min and break, then resume. I also am always excited to start a new piece. Just starting Suzuki 4! February 25, 2018 at 04:18 AM · Great bit of writing and an even greater bit of advice. Big thanks! February 25, 2018 at 07:20 AM · Love the #19!!! Thanks for sharing your story!!! February 25, 2018 at 03:12 PM · A great compilation of all the DO's and DON'T that apply to learning the violin. Applicable to many other pursuits also. - Go to as many concerts as you can. Watch videos of the virtuosos. - Practice contrasting pieces e.g.., one a slow one requiring a lot of expressiveness and the other a fast paced with lots of ornamentation like trills, turns. One soothes the other challenges you to stretch! February 26, 2018 at 07:43 PM · It took me 10 years to realize the importance of #6, so kudos to you. #3 -- Haha! February 28, 2018 at 01:32 PM · My approach is a little different. I'm not interested in learning to read, so all my practice sessions involve listening to music and playing along by ear. I've found my own style, and love to go out and jam with other people, so that's another option someone might want to consider if they're starting out later in life. I just turned 74. March 2, 2018 at 07:02 AM · #5 is extremely difficult for people who are working full-time. 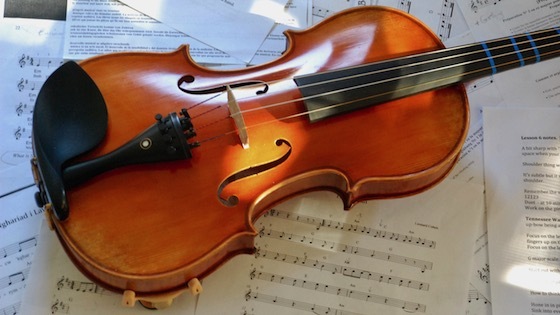 I'm an early-career lawyer (think: busy) and rarely able to practice before 8:30pm, and my schedule has been similarly busy for almost the entire time I've played the viola, as I started at the end of high school. I just end up squeezing in every minute I can before 10pm, which is when I have to stop as per apartment rules. March 2, 2018 at 05:59 PM · Thanks, Andrew. I agree with the problems full-time workers face regarding finding time to practice. I had the same problems playing flatpack guitar and mandolin. Here is a suggestion. Practice at work. I was a high school teacher for 37 years. With 180 students a day, thousands of papers to grade, and on and on, time was precious. So, I brought my mandolin to school and practiced during my lunch period. (30 minutes.) I also organized a weekly Lunch Jam with other faculty members. It is amazing how just 30 minutes of jamming can energize a workday. We'd get together each Wednesday, kick out about half a dozen songs during our lunch period, and then head back to class. Ultimately, we became a jug band, King Kennedy and the Cruisers, and played at the Minnesota Battle of the Jug Bands. I've been retired for 5 years. The other teachers/musicians have moved on to other bands and continue to play. With 14 years of playing, I assume your neighbors welcome hearing your music. I'd be delighted to hear you as well and I hope to get to that point somewhere down the road. For the moment, with only 9 months under my belt, I look on playing during the day, when everyone else is away and at work, as a public service. March 3, 2018 at 02:34 PM · Extremely helpful and inspirational. I am a 62 violin student that has struggled with hand, shoulder and neck issues. I am just fascinated by learning the violin. Much of what you stated rings true to my own experience, and encourages me to continue on. Thanks for the insights!